Ford just released EPA fuel economy ratings for the 2017 Ford F-150 with the second-generation twin-turbo 3.5-liter V-6 EcoBoost and 10-speed transmission. As a quick reminder, the new and improved engine makes 10 more horsepower (now 375 hp) and 50 more pounds-feet of torque (now 470 pounds-feet) than the 3.5-liter V-6 EcoBoost it's replacing. And although those numbers don't sound dramatically different, we can say the performance of the new combination — due in large part to smarter computer tuning — is impressive. Here are the new EPA numbers: A 2017 4x2 3.5-liter EcoBoost gets 18/25/21 mpg city/highway/combined — it was 17/24/20 for the 2016. For popular 4x4 models, fuel economy increases to 17/23/20 compared to 16/22/18 for the 2016. 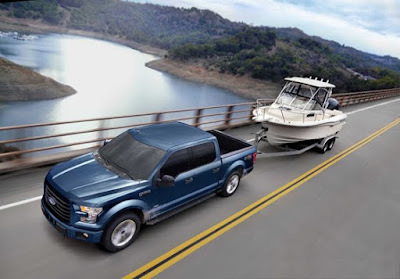 For comparison purposes, the 4x2 Chevrolet Silverado 1500 and base Ram 1500 naturally-aspirated V-6 models are EPA rated at 20 mpg combined, while the same trucks with the V-8 option (Chevy 5.3-liter and Ram 5.7-liter) have combined EPA ratings of 18 and 17 mpg, respectively. The half-ton pickup fuel economy leader is the Ram 1500 HFE with the 3.0-liter V-6 EcoDiesel with EPA ratings of 21/29/24 mpg city/highway/combined. The second-generation EcoBoost V-6 is the same engine and transmission combination that will be in the 2017 Ford Raptor, but it will offer 450 hp and 510 pounds-feet of torque in that pickup truck. All axle gearing in regular F-150 models remains the same, as does payload and tow ratings for the various configurations and trim packages.